The unexpected downside to society’s frenetic progress and its focus on reason is that many people are left feeling stressed and empty. Both at work and at home, they are facing huge levels of expectation that they simply cannot meet. The time has come to rediscover one’s true self. By asking the right questions, this book will help you to find out who you really are, to define what motivates you and to envision what you stand for. It will allow you to develop the necessary resilience to direct the story of your life, even during difficult times. It is only when our being and our actions match perfectly that we can be true to ourselves and be successful, both professionally and personally. Anneliese Monden and Chantal Smedts are both experienced coaches, certified by the International Coach Federation. In this book, they share their insights and tools directly derived from their coaching and training practice with the pure intent to inspire people to become more true to themselves, and therefore more successful in life. 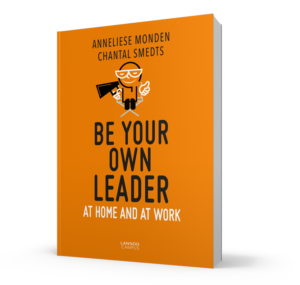 More ‘Be your own leader’? Not such a reader? Or you’ve just finished the book and you’re ready to take action? Then our Be your own leader – improvisation workshop is an ideal start from which you will derive 5 actual growtips for yourself. Ready to become a better you? The Be your own leader – Basic training is designed to help you discover your authentic self and to align your personal and professional goals. You participated in the workshop, training or you read the book? Then you’re ready for the Be your own leader – deeper development training.